Paint By Number, Part Deux — Paolo M. Mottola Jr.
We've painted nearly every square inch of the inside of our house (Paint By Number, I Wish) and, labor aside, that has been an ongoing task of color choice. Now we're taking on the outside of the house. 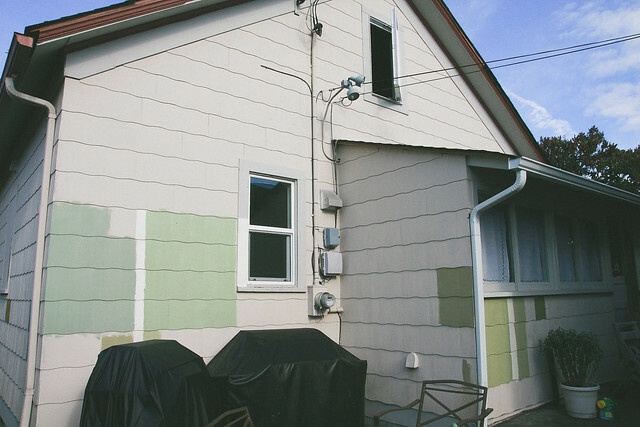 We've wanted to paint the house from the start. I almost didn't buy it because it was such an eyesore. 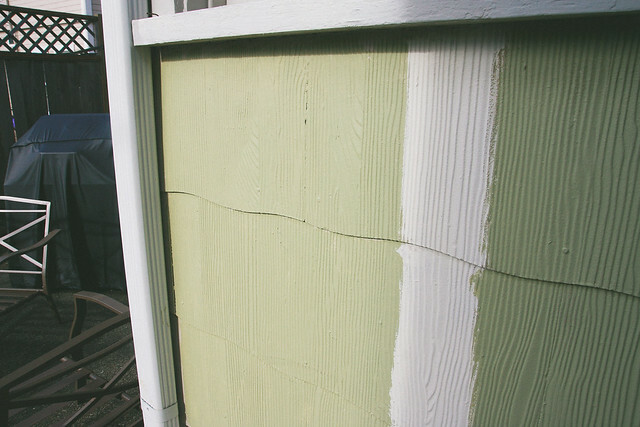 The new color should bring a vast improvement to corner appeal and moreover seal the home from pests. Dealing with possums once was enough. I don't want to have to punch bees in the face. Over the past three years, we got the interior colors about 60% right the first time. We replaced the kitchen from oak stain to yellow to brown back to red mahogany stain, the guest bathroom from baby blue to tan, and I'm tempted to change the mud room from red to navy in short time. Oh, and on the subject of all that painting, I am NOT painting the outside of the house. I'm taking a break and leaving this very visible task to a family friend that we're hiring. All that prep, all that painting. Oy. I'm gladly taking on a fence replacement project instead. Compared to choosing those interior colors, choosing the paint for the outside hasn't been an easier process. We need to be at 100% the first time, so we've belabored the color selection process. 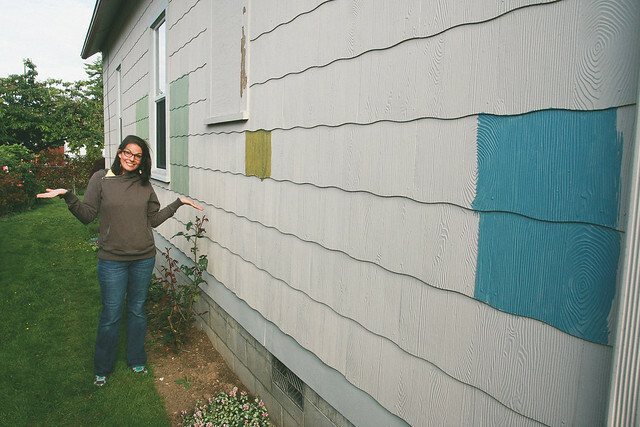 The back of our house is now a checkerboard of green swatches. We started with greens that were more blue than yellow and weren't impressed by the first couple colors we tried. They looked too much like turquoise. We went back to the paint store and tried a couple more colors that leaned toward browns and yellows and they were a lot closer to the "olive" that we'd been looking for. Of course, the colors weren't called olive, they were "Cress Green" and "Woolen Vest." Still, after staring at those colors after a couple of weeks, we wanted to try a couple more just to be sure. Leave it to my wife to throw me off and pick a bright blue out of nowhere, which ended up looking more like bubblegum. The other colors, including one called "Sweet Annie," were close but didn't make the cut. In the end, "Cress Green" was our choice (or it is for now!). The home should be painted by the third week of July, so stay posted for pictures! This is Cress Green in sunlight and shadow with the trim, "Morocco Sand," in the middle. 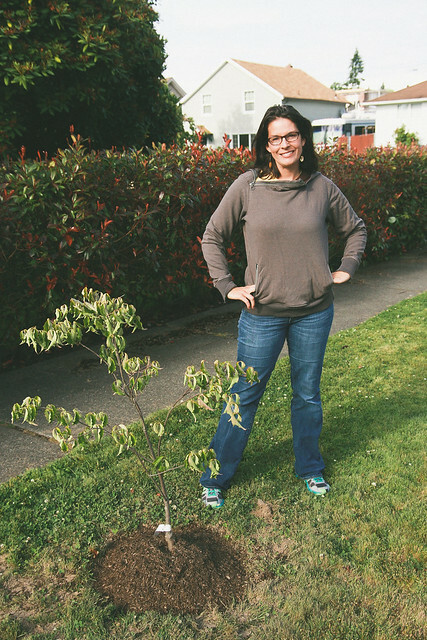 Because we're in a bit of a waiting game now, we threw down at the local farmer's market for a couple of flowering dogwood trees for our exterior yard for instant gratification. They're young, but they'll grow!